On Monday, the leading presidential candidate for the Republican Party, Donald Trump proposed banning an entire group of people from the United States, based solely on their religious preference. Even the neocons on the right and left were forced to make statements opposing his outlandish proposal. However, many people actually supported this tyrannical notion. Jones’ assertion that upwards of 25% of Muslims have gone on record and said they want to “conduct violent attacks” against the US and Europe is supported by zero evidence. In fact, Infowars published an article Wednesday, linking to the actual data which proves them wrong. In a blatant attempt to strike fear into the hearts of their xenophobic reader base, (who used to be antiwar and pro freedom of religion) Jones shills once again for Trump by pointing out that 21% of Syrians polled have favorable views ISIS. What Infowars conveniently left out, however, is the fact that the country with the highest levels of support for Isis outside Syria showed only 14 percent of people having a favorable view of the group. None of the data showed that any of these supposed ISIS supporters “want to conduct violent attacks in Europe and the United States.” Nevertheless, Jones, Trump, and the rest of the fascist Muslim-fearing cowards have been pushing this narrative and stoking dangerous levels of hate, because they are buying into the ISIS propaganda. Aside from the insanely off keel generalization that highlights a deliberate ignorance among those pushing such fear, the effects of said fear are dangerous. 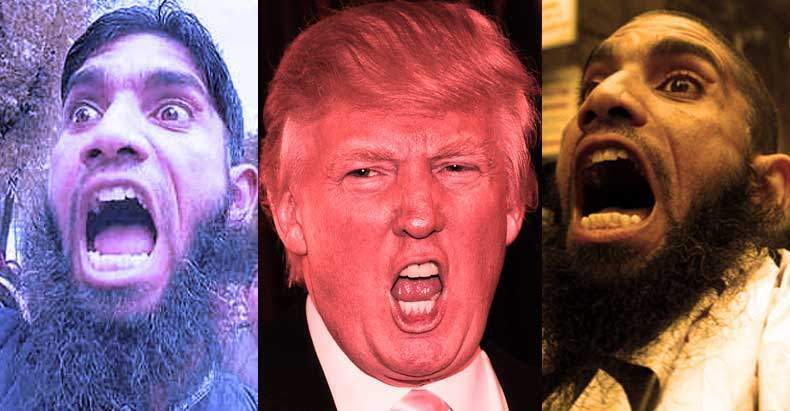 The impact of fools spreading hate have already begun to materialize, sending ISIS into a fury of celebration – as creating a divide between Muslims and everyone else is their stated mission. As the Free Thought Project’s Jay Syrmopolous points out, if there is one thing that Islamic fundamentalists and Islamophobic fascists like Trump agree on, it’s that there should be no “gray zone;” only black and white. Now, the terrorists and the demagogues in the West are getting closer to their goal of divide and conquer than ever before. We are witnessing Muslims being thrown off of buses because of ignorant passengers fearing for their lives. We see physical assaults waged by fearful pawns in ISIS’s propaganda campaign against peaceful Muslims, who’ve harmed no one. Since the Paris attacks alone, there have been two-dozen anti-Muslim attacks in the United States. These attacks range from rubbing human feces and leaving pigs heads outside of mosques, to beating and even killing people for their religion. If you are willing to harass, hurt, or kill an innocent person because of their religion, you are no better than ISIS. You are also hurting the fight against terrorism. Just this week, 70,000 clerics came together, representing the majority of the Muslim world and publicly denounced ISIS as a threat to humanity. The way to truly defeat ISIS is by rendering their fear and divisive tactics impotent. The US needs to show ISIS, and those being manipulated by their tactics, like Donald Trump, that tolerance and freedom are far more powerful than bigotry and hate. Also, Americans will do well to remember how it was that ISIS came to be in the first place, and avoid future murderous blunders that will inevitably fill the ranks of extremist groups with even more susceptible victims of Western foreign policy. You can bow down to the will of ISIS by allowing their hate-filled rhetoric and divisive tactics to cloud your mind with fear and hatred. Or, you can rise up and stand against those who would drive a wedge through the heart of humankind. The choice is yours.